Author(s): Tao Su, Woodrow C. Monte, Xintian Hu, Yingge He, Rongqiao He. Institute of Biophysics, Chinese Academy of Sciences, 15 Datun Road, Chaoyang District, Beijing 100101, China. Recently, formaldehyde (FA), existing in a number of different cells including neural cells, was found to affect age-related cognitive impairment. Oral administration of methanol (the metabolic precursor of FA) triggers formation of senile plaques (SPs) and Tau hyperphosphorylation in the brains of monkeys with memory decline. Intraperitoneal injection of FA leads to hyperphosphorylation of Tau in wild-type mouse brains and N2a cells through activation of glycogen synthase kinase-3β (GSK-3β). Furthermore, formaldehyde at low concentrations can directly induce Tau aggregation and amyloid β (Aβ) peptide deposits in vitro. Formaldehyde-induced Tau aggregation is implicated in cytotoxicity and neural cell apoptosis. Clarifying how FA triggers Aβ deposits and Tau hyperphosphorlyation will not only improve our understanding of the molecular and cellular mechanisms of age-related cognitive impairment but will also contribute to the ongoing investigation of alternate targets for new drugs. Here, we review the role of FA, particularly that of endogenous origin, in protein aggregation and as a potential drug intervention in the development of agerelated cognitive impairment. Keywords: Aggregation, Alzheimer’s disease, Amyloid β, Aspartame, Formaldehyde (FA), Hyperphosphorylation, Methanol, Tau protein. Affiliation:Institute of Biophysics, Chinese Academy of Sciences, 15 Datun Road, Chaoyang District, Beijing 100101, China. Keywords:Aggregation, Alzheimer’s disease, Amyloid β, Aspartame, Formaldehyde (FA), Hyperphosphorylation, Methanol, Tau protein. Abstract:Recently, formaldehyde (FA), existing in a number of different cells including neural cells, was found to affect age-related cognitive impairment. Oral administration of methanol (the metabolic precursor of FA) triggers formation of senile plaques (SPs) and Tau hyperphosphorylation in the brains of monkeys with memory decline. Intraperitoneal injection of FA leads to hyperphosphorylation of Tau in wild-type mouse brains and N2a cells through activation of glycogen synthase kinase-3β (GSK-3β). Furthermore, formaldehyde at low concentrations can directly induce Tau aggregation and amyloid β (Aβ) peptide deposits in vitro. Formaldehyde-induced Tau aggregation is implicated in cytotoxicity and neural cell apoptosis. 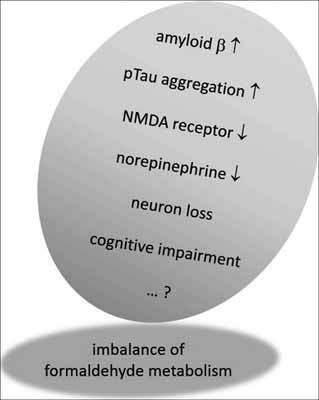 Clarifying how FA triggers Aβ deposits and Tau hyperphosphorlyation will not only improve our understanding of the molecular and cellular mechanisms of age-related cognitive impairment but will also contribute to the ongoing investigation of alternate targets for new drugs. Here, we review the role of FA, particularly that of endogenous origin, in protein aggregation and as a potential drug intervention in the development of agerelated cognitive impairment.